Let me start with a confession: even though I've been writing about the sport for a number of years, I'd never read a book about athletics. Most of those that I'd come across were either biographies - which I don't really like - or statistical compendiums which I like even less. 'Born To Run', however, promised to be different which is why it was so intriguing. For one thing it dealt with ultra running which is a very particular niche within the sport and therefore hardly likely to follow the same styfied approach of other books. And so it turned out to be. Indeed it was much more then I ever expected. 'Born To Run' starts from a simple premise: plagued by a number of running injuries and repeatedly told to choose another hobby, author Chris McDougall asked himself why his ankle hurt when running, particulalrly given the research that goes into the technology of modern running shoes. Accidentally coming across a native American tribe called the Tarahumara who live in the Mexican desert and who can run for long distances over prohibitive terrain in sandals proved to be the tipping point as he set out to discover their secret. That he manages to do, ultimately curing himself and taking part in a race involving the both Tarahumara and a number of leading ultra runners. It is this journey - which ultimately is one of self discovery - that he talks about in this book. 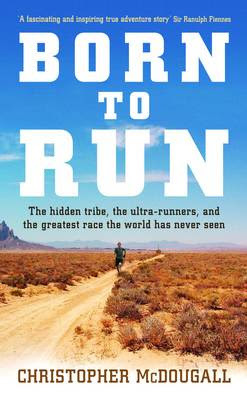 The beauty of 'Born To Run' is that McDougall manages to balance the personal side of the story with the wider picture of running as an act. Throughout his talk diverts into an attack on the shoe industry, confirmation of the theory that man was indeed built to run and into talks about nutrition. In doing so, his risk was that of adopting a preacher's tone with the result of boring the reader. McDougall, however avoids this purely because he has no intention of trying to convert people to his way of thinking but rather is relaying his excitement and fascination at learning about each one. And this, his ability to relay his emotion, is what makes this book work so well. 'Born to Run' is a truly wonderful book, among the best that I've read this year. Irrespective of whether you have an interest in athletics or whether you are a runner yourself, this is a book that must be read.